Cleda Lee Obituary - Ironton, Missouri - Bryson Funeral Home, Inc. Profile of Bryson Funeral Home, Inc.
Cleda Mae Lee of Ironton passed away May 1, 2012 in St. Louis at the age of 72 years. She was born August 12, 1939, at home in Franklin County, a daughter of the late Herman and Hazel Alice (Niblett) Cluck. On March 8, 1958 she was united in marriage to Donald Gene Lee, who survives. To this union two children were born Donald Ray Lee and wife Theresa of Ironton, MO and Deborah Peters and husband Tony of Ironton, MO. 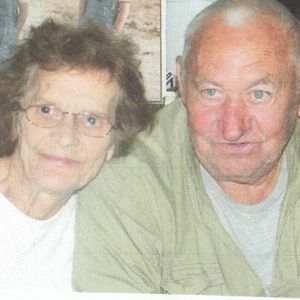 Also surviving are five grandchildren; Maxwell Lee, Michael Lee, Brittney Peters, Matthew Lee, and Jacob Peters, four sisters; Mary Maynard of Paragould, Arkansas, Frances (Keith) Trotter of Illinois, and Linda (Wendell) Darnell of Illinois and Judy (Jackie) Marvel of Benton, Illinois, seven brothers; Ralph Cluck of Overland, MO, Richard Cluck of Benton, Illinois, Jimmy Cluck of Illinois, James Cluck and special friend Judy Hopper of Illinois, Kenneth Cluck of St. Louis, MO, Lowell (Debbie) Cluck of Illinois, and Michael (Cindy) Cluck of Illinois, as well as a host of nieces, nephews, other relatives and friends. Cleda was preceded in death by twin granddaughters; Natalie and Nichole Peters, a brother, Donald Cluck, and a sister Betty Perkins. The beautiful and interactive Eternal Tribute tells Cleda's life story the way it deserves to be told in words, pictures and video. We remember Aunt Cleda chasing Guy with a water hose at a bbq we had. He picked her up and was carrying her to the water trough, (because you know, he always gets his payback twice as bad)!! She was screaming to the top of her lungs, GENE!!! But, Unc was busy visiting and didn't hear her. So she just took off her shoe and proceded to whip the tar out of Guy. That was the good old days. Cleda, you will be missed. We love you and will always remeber you in those good times...Rest in Peace. So sorry for you loss she was a wonderful woman and will be missed. I can remember her beating Ronnie with her shoe. You were more than a mother to me you were my dearest friend. I love you more than words can ever say, and I will always carry you in my heart forever. Not a day will go by without me wanting to talk to you, so instead of picking up the phone, I will simply look up and send my prayers your way. I will cherish all the times we had and always look toward you for advice. I will see you again, until then catch a ride on a raindrop and visit me often, I love you!